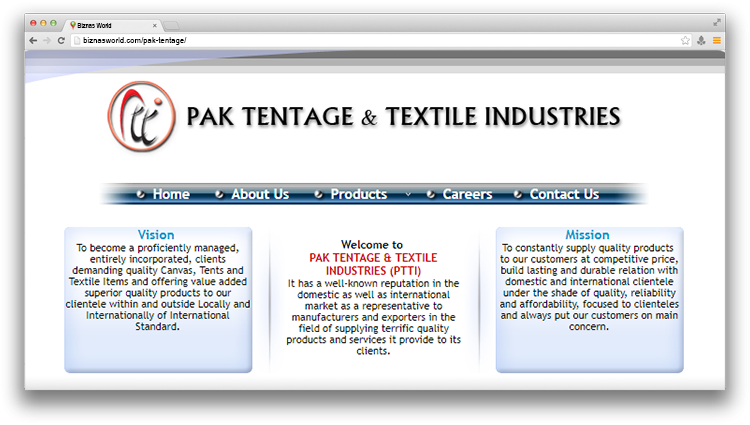 Description Pak Tentage & Textile Industries has a well-known reputation in the domestic as well as international market as a manufacturer and exporter of terrific quality products and services it provide to its clients. Since inception 2006, Pak Tentage & Textile Industries has become one of the reliable and trustworthy Supplier of Canvas Tents, Tarpaulins and Canvas Material and supplier to many countries. Address Gulistan E Jauhar Karachi.